After seeing this awesome photo I had to try it out! Also, having a protein based breakfast along side some healthy fats and fibre, whilst avoiding sugars is a great way to start the day as you won’t get a peak and crash from your sugary energy source (grains). … So my first mistake was cutting the peppers too thin. I cut them to about 15-20mm thick but actually at least an inch is needed. A large bell pepper would be more appropriate, not a small-medium one which is what I had bought. In any case, they tasted awesome! (Although some of the egg escaped from there peppery cases). 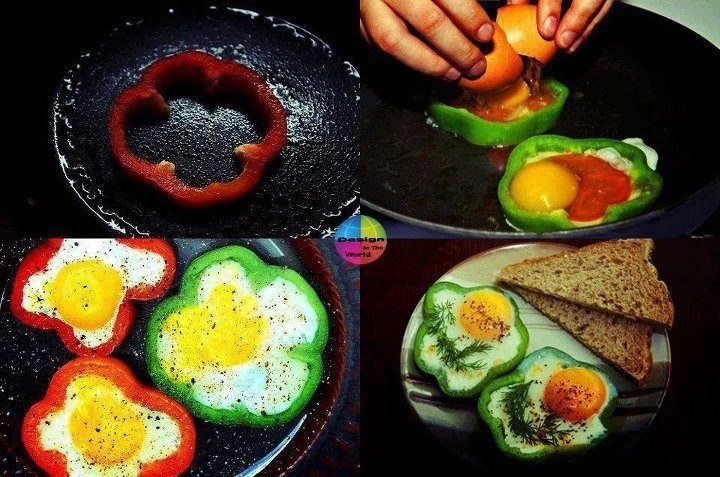 However, I didn’t just have eggs in peppers. I also made myself a quick salsa and topped with sliced avocado too. This took about 2 minutes to make and is super easy.